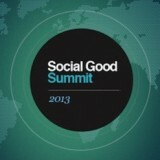 How to Change the World has its origins in the Social Good Summit held at the 92nd Street Y in New York. The summit brought together some of the world’s most creative entrepreneurs, writers, academics and political leaders to discuss ways innovative thinking and technology can address pressing global challenges. Beginning from talks, panels and conversations from the summit, we will add lectures, on-line discussion groups, hangouts and readings to explore the issues in politics, technology and the environment in broader academic and historical contexts. We will then discover together what actions we can take to make a difference. How to Change the World examines how we can develop “social goods” and use them to create networks of progressive change. Classes will explore the meaning of “social goods” and then address the following topics: Poverty and Philanthropy; Climate Change and Sustainability; Women, Education and Social Change; Social Networks, Education and Activism. Each week will be structured along the following questions: 1. What do we know? 2. Why should we care? 3. What can we do? At the end of the class students should have a clearer understanding of these global issues, and they should develop strategies for working with others to begin to address them. Our aim is simple and bold: to put together the facts, the energy and the actions to make a real difference in addressing some of the major problems confronting the world today. I am very much interested in taking this course because it aligns very well with my vision as an educator in Liberia. I seek to help change the world through poverty reduction gender mainstreaming and useful education. Thanks for creating this opportunity for busy people like us.